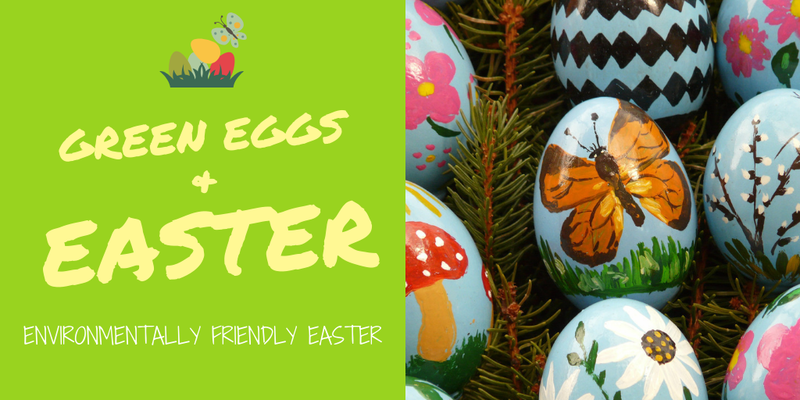 With Easter fast approaching, now is a good time to start planning your Easter activities. Would you like to make your Easter environmentally friendly and green this year? There are ways to keep to the traditions of Easter (whatever they may be to you and your family) without making huge compromises, and still reduce your impact on the environment. Certified Sustainable Palm Oil or Pail Oil Free: Palm oil plantations are a serious environmental issue because they are responsible for large amounts of deforestation and threats to endangered wildlife in areas like Malaysia and Indonesia. Palm oil is often used in the production of chocolate. But keep and eye out for chocolate with Certified Sustainable Palm Oil or are Palm Oil Free (Gredley 2016). Packaging: Unfortunately, Easter Eggs are often wrapped in an excessive amount of packaging. While the foil of Easter eggs is generally recyclable, the plastic packaging and display boxes with clear plastic windows are not. And you may not notice, but you are often paying a premium for the extra fancy packaging. In 2018 an audit of British supermarkets showed that on average packaging accounted for 25% of the weight of the Easter Egg (Mitchelson 2018). So before making a purchase have a look at the packaging, to see what you are actually buying (chocolate or a pretty packet). In some cases, you may want to consider buying a block of chocolate rather than an Easter egg (a reasonable option for those who value quantity and adults who do not mind what the chocolate is wrapped in). Chocolate with a Cause: Why not support a good cause through your chocolate purchase? In Australia rabbits, the iconic Easter animal is an introduced species that cause a lot of problems. 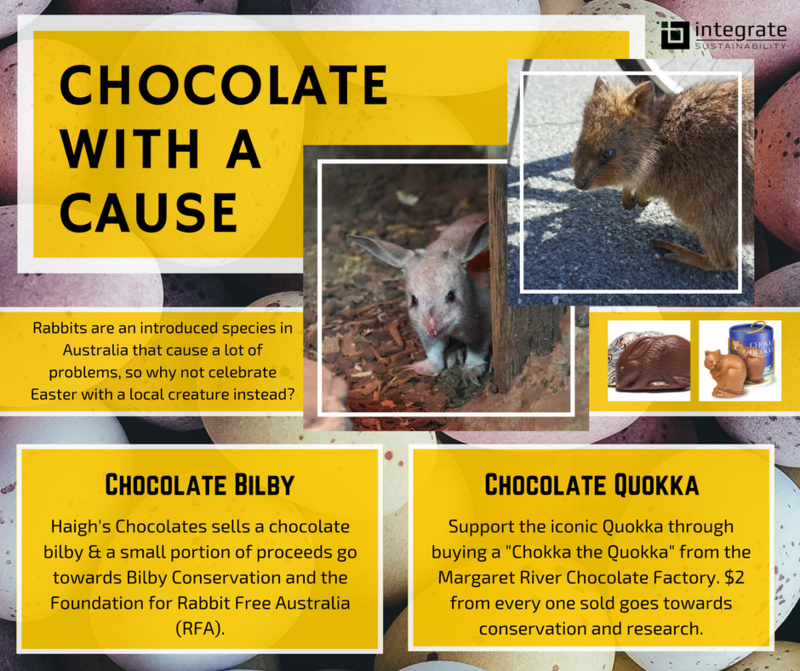 Did you know there’re Chocolate Bilby’s and Quokka’s available this Easter that have a portion of proceeds going towards the conservation of the respective animals? Easter is also a good time to donate, whether that be money or food supplies (and maybe a little bit of chocolate) to a local charity so that everyone can enjoy this Easter break. Decorating Easter Eggs: Another notable Easter tradition that can be made environmentally-friendly by first not purchasing plastic eggs. For some different Easter egg decorating and creation ideas head to 20 Eco-Friendly Easter Egg Ideas. 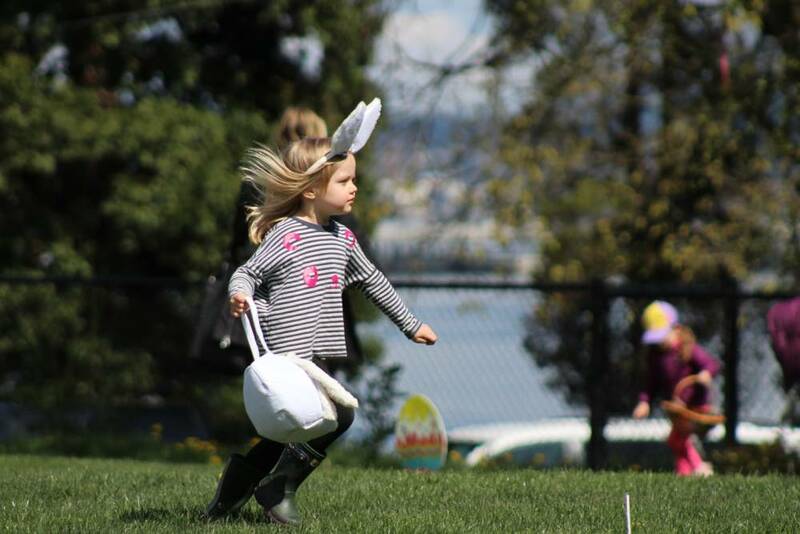 Incorporate Nature: How about incorporating nature into your Easter egg hunt? This way kids can learn a little bit about the environment as they have fun. Make it a game, teach them about different things like reduce – reuse – recycle, or our Australian Easter representatives the Bilby and the Quokka (Cronin 2018). Seafood on Good Friday is a tradition held by many Australians. I recommend that you refer to Australia’s Sustainable Seafood Guide or their free app before making your seafood purchases to ensure that the goods have been sustainability caught or sourced (Gredley 2016). Reduce the energy consumed by your home when you are away by checking that electrical appliances are turned off. Leave no Trace – be considerate of our natural spaces. Don’t leave behind any rubbish, be considerate of wildlife and take into consideration fire restrictions. 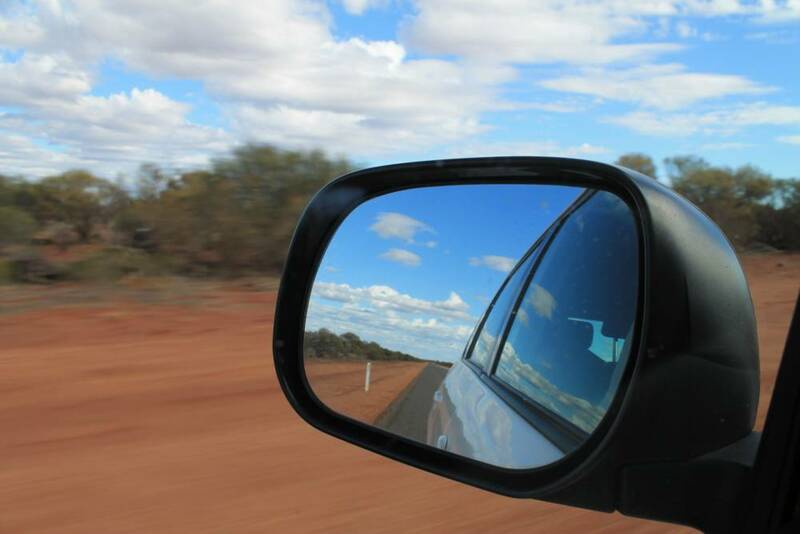 If you are not planning on travelling this long weekend, why no find some time to enjoy nature with your family and friends? 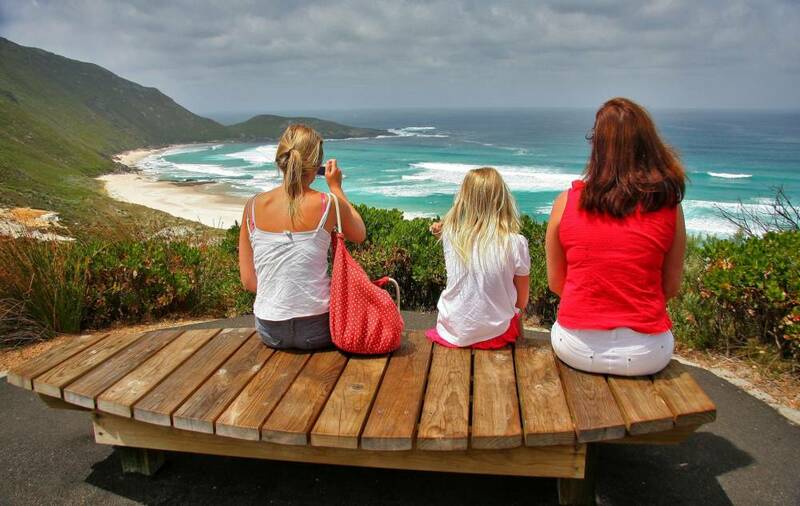 Visit a local park or beach, go bushwalking or plant a tree (why not?). Cronin, Lina. 2018. E.A.S.T.E.R [Easy, Affordable, Sustainability Tips – Easter Related]. March 21. Accessed April 3, 2019. https://www.ecotourism.org.au/news/e-a-s-t-e-r-easy-affordable-sustainability-tips-easter-related/. D’Alessandro, Nicole. 2014. 20 Eco-Friendly Easter Egg Ideas. April 2. 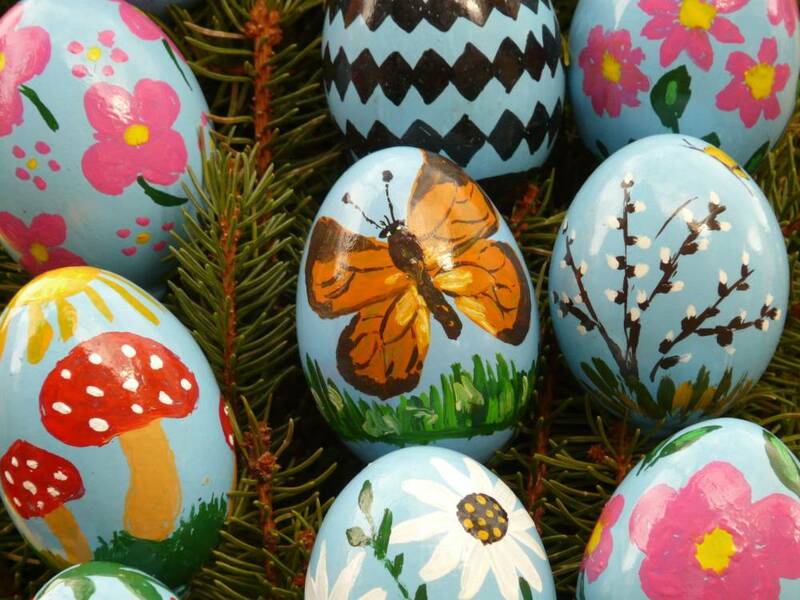 Accessed April 03, 2019. https://www.ecowatch.com/20-eco-friendly-easter-egg-ideas-1881883622.html. Fairtrade Australia and New Zealand. 2016. 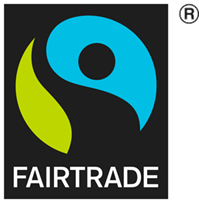 WHAT IS THE FAIRTRADE MARK? 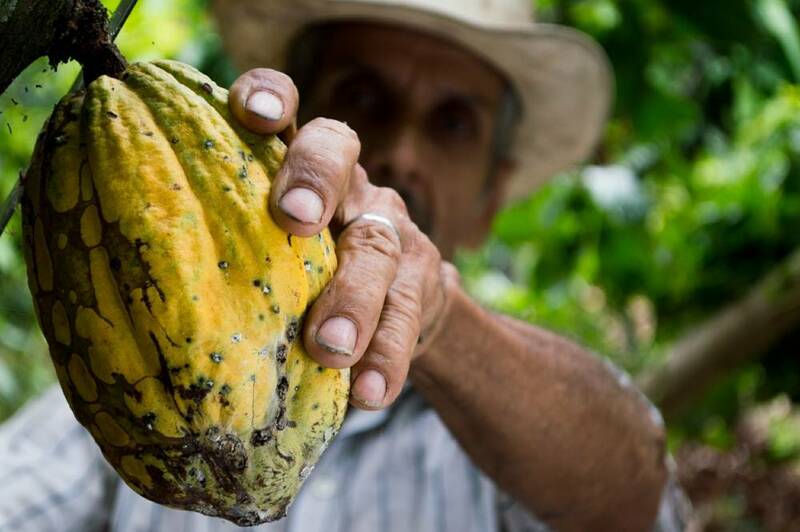 Accessed April 1, 2019. http://www.fairtrade.com.au/What-is-Fairtrade/What-is-the-Fairtrade-Mark. Gredley, Rebecca. 2016. Planet Ark News – Have An Eco-Easter. March 23. Accessed April 1, 2019. https://planetark.org/news/display/1044. Mitchelson, Alana. 2018. Easter eggs hurt your wallet – and the planet. March 26. 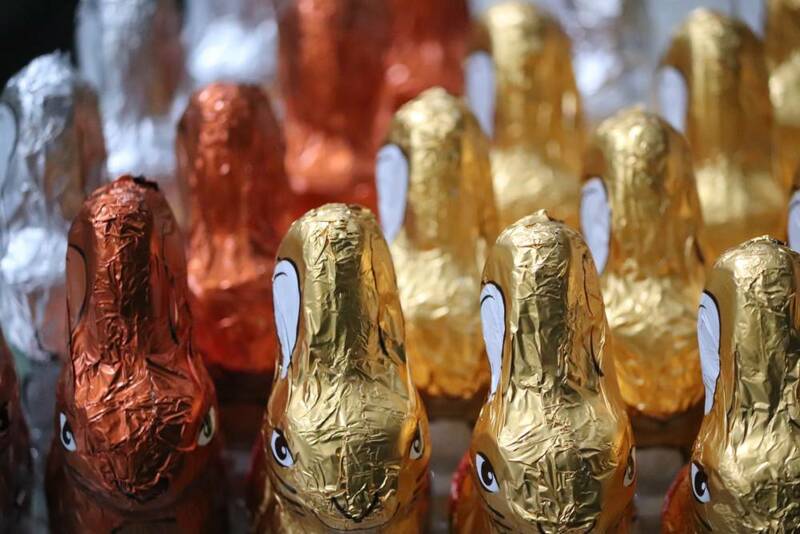 Accessed April 26, 2019. https://thenewdaily.com.au/money/your-budget/2018/03/26/easter-egg-chocolate-packaging/. Mortgage Choice. 2019. How to prepare for Easter (the environmentally-friendly way). Accessed April 2, 2019. https://www.mortgagechoice.com.au/blog/lifestyle/2019/03/how-to-prepare-for-easter-the-environmentally-friendly-way/. Murphy, Maddie. 2019. Take Out the Trash: Eco-friendly Easter Basket Ideas. March. Accessed April 3, 2019. https://www.tenthousandvillages.com/mosaic/take-trash-eco-friendly-easter-basket-ideas/. PlushBeds California. 2015. How to Plan an Environmentally Friendly Easter. Accessed April 1, 2019. https://www.plushbeds.com/blog/green/how-to-plan-an-environmentally-friendly-easter/. The Art of Simple. 2010. Craft An Eco-Friendly Easter. Accessed April 3, 2019. https://theartofsimple.net/craft-an-eco-friendly-easter/. What do we do all day? 2014. 10 WAYS TO HAVE AN ECO FRIENDLY EASTER. April 16. Accessed April 3, 2019. https://www.whatdowedoallday.com/eco-friendly-easter/.